Technology has come a long way and somewhere along that road, we reached a place where we can set our home up to peek in on, at all times – no matter where in the world we are located. For some people, checking in on your dog while they’re away is too tempting an option to resist. If you’re one of those people, you may be surprised with how many extra features you can get in with your dog monitoring camera; or how reasonably priced it can be! We reviewed dozens of dog monitor cameras to identify the best of the best. We looked at Wi-Fi capabilities and video quality, along with the ability to store footage and the best app interface. We evaluated all the aspects that make each camera worth more than a second look and listed them for you. The Wansview Wireless IP Camera will give you a crystal clear peek into your pup’s daily life and so much more! In scouring the web for the best dog monitoring cameras, we found a clear standout in the Wansview Wireless IP Camera. With its crystal clear video quality and the ability to store footage via email or SD card, you’ll be as impressed by this camera as we are. 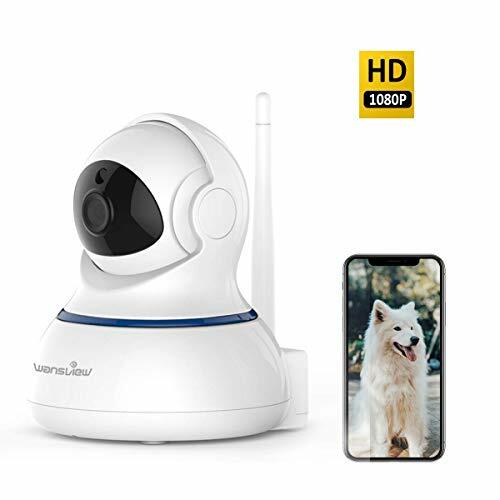 With the Wansview Wireless 1080P IP Camera you can watch your pup on any browser with an internet connection or download an app onto your phone for an even easier method of checking in on your dog. The Wansview app works on both iPhone and Android and by adding an SD card to its slot (SD Card sold separately), you can store up to 128 GB of playback to look back on and discover exactly where that mess came from, for example. You can talk to your dog through this camera and hear his response with its 2-way audio capability and a 1080P HD video quality won’t have you guessing what you’re looking at while you talk to him. This is particularly helpful if you’re talking your dog out of bad behavior or if you’re comforting him from some separation anxiety. This monitor has an Amazon rating of 4.2 and over 1,000 customer reviews, there is certainly plenty of pleased owners of this camera. And for all you get with this camera, you’re pretty likely to be please, too. Provide treats, soothing scents, and your voice with this dog monitor camera that will have you taking care of your puppy, no matter how far you go. 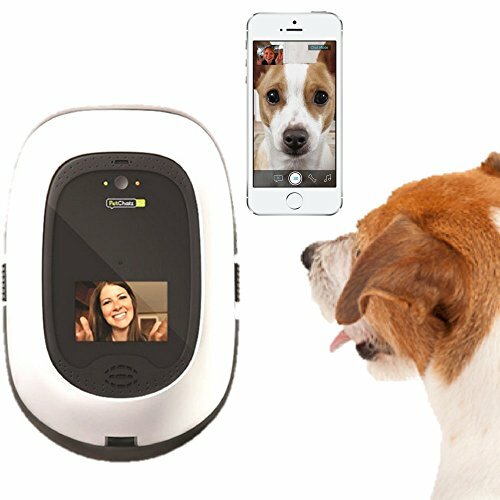 The PetChatz HD: Two-way Premium Audio/HD Video Pet Treat Camera allows you to interact with your pup even when you’re not there. You can add subscriptions to DogTV to give your pup something to watch, dispense treats or even emit a soothing aromatherapy scent that will relax him, should he be handling your separation poorly. The manufacturer has dubbed this dog camera the “digital doggy day care,” because it will allow you to take care of your dog digitally. By downloading the PetChatz app, you can allow him to see live video of you, while you’re watching him to make your interactions perfectly timed; and you’ll both be able to hear each other this way, as well. You can reward him with treats if you ask him to do tricks, like sit or speak. You just load the cam up with treats and it will drop them when you push the button. When the treats are running low, there’s an LED light that will indicate that, too. It even has motion and sound detection so your pup won’t be able to hide from you. With an Amazon rating of 4.2 stars an over 300 customer reviews, you can invest in this dog monitor camera and digital doggy daycare with confidence in your purchase. For a great value that will allow you to monitor your dog and your house, check out the YI Dome Camera. The YI Dome Camera is designed to be a security and surveillance camera but as a dog monitor camera, it has plenty to entice, too. It goes the extra step in audio with the 2-way audio that offers a crisp sound that doesn’t pick up the background noise like a lot of its competitors do. You can also pan and tilt this camera manually or save your favorite positions in up to 8 different presets. With the motion detection, you can set your camera up to notify you for motion and you’ll get an alert sent to your phone. If you’re using this to monitor your dog, you may opt not to use this but if you have a lounging dog, who takes up residence on a sofa and doesn’t move much, this could still be a good feature. Or it could be great to get a couple of these and set them up all over, so you can track when your dog sitter rings the bell or when your dog decides to drag his trouble elsewhere in your house. And for just under $35, you’ll appreciate how forgiving getting a few of these can be to your wallet, too. This camera has over 4,500 customer reviews on Amazon, with an overall rating of 4.0 stars. It’s Amazon’s #1 Best Seller for Dome Surveillance Cameras and if you set it up for your dog, you’ll appreciate how well it can monitor your fur baby, too. Even when you’re away from home, you can still reward your pup and teach him to catch treats you toss in the air with the Furbo Dog Camera: Treat Tossing. 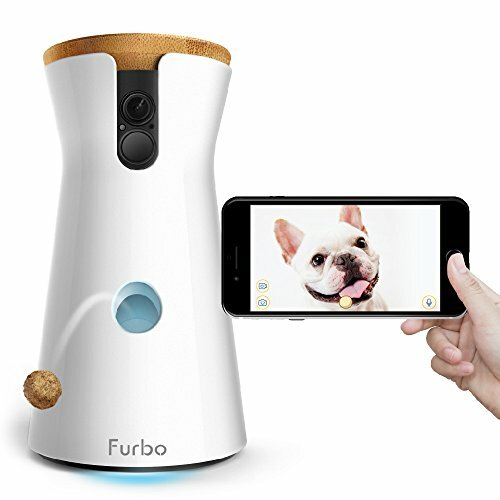 The Furbo Dog Camera: Treat Tossing is a dog monitor that does just what the name suggests: allows you to watch your dog live and toss him treats as if you were there with him. In fact, this will even work with Alexa, so you could theoretically do most of your dog monitoring and treat dispensing without getting up from the couch. And for when you’re away, there’s a Furbo app that will allow you to interact with him virtually anywhere. This monitor has sound detection and will send an alert to your phone (if you choose to set it up this way) so that you know when your dog has barked, so you can check in on him to make sure everything is okay. If it is, you can use the 2-way audio and comfort him with the sound of your voice. With over 1,800 customer reviews on Amazon, earning this monitor a 4.1 rating, you can understand why this is Amazon’s Choice of Furbo products. And, really, anything that lets you play with your fur baby while you’re away and missing him is a solid win for us. You’ll love the back and forth chat you can still have with your pup while you’re away with the Pyle SereneLife Indoor Wireless IP Camera. The Pyle SereneLife Indoor Wireless IP Camera will have your dog so well looked after, you may not notice a difference in his behavior at all. Using the 2-way audio, you will be able to talk to him as often as you want and listen as he barks back. The camera also features night vision, allowing you to check on your pup just before you go to bed, or even on dark stormy days. If you’d like to record, there is an SD slot that will allow you to do so using up to a 64GB card. 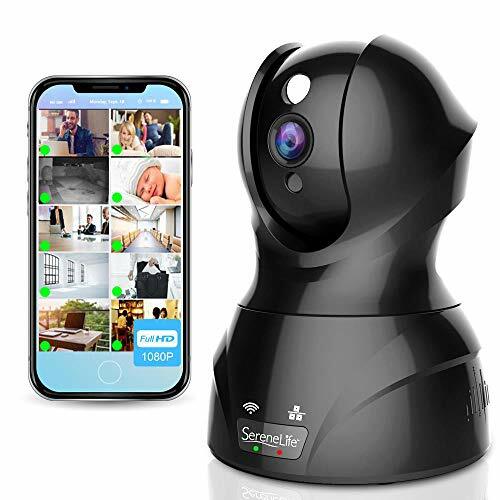 You can choose from a 24-hour recording mode, a motion detection trigger or simply schedule a recording period for specific times, giving you plenty of choice and ability to minimize the dead space filled on your SD card. Or you can add the “cloud box” to your system and record up to 180 days of video – More than enough to watch to make sure your pup did well while you were away. This camera has over 300 customer reviews on Amazon which have earned it a respectable 4.4 star rating. It’s the #1 Best Seller for Document Cameras, but when it comes to dog monitor cameras, this camera leaves very little to be desired. If you have a dog whom you adore but have to leave periodically, occasionally or often, you may want to look into purchasing a dog monitor camera. Whether you work full-time or have him being watched by a pet sitter while you’re on vacation, checking in on a dog you love is a peace of mind that you are sure to appreciate. These cameras certainly can come with enough bonus features to tempt you; between treat dispensing, 2-way audio, and more, your dog will come to love the dog camera monitor, too. This is also a great tool for your great mysteries. If every day your trash gets knocked over or another pillow gets chewed and you simply don’t know which pet is to blame, this is the perfect tool to encourage your detective nature and get to the bottom of it. Plus, you may also pick up a 2-way monitor so catching the culprit also means correcting him. You can let your dog know verbally that you know what he’s doing, while he’s doing it. Sometimes all your pooch needs is a verbal reminder of who’s good boy. 2-way audio. If your pup is trained to respond to verbal commands, you may struggle with the idea of seeing his bad behaviors on a camera but not being able to do anything about them. And a 2-way monitor can certainly help that. Of course, you have no physical recourse, should he call your bluff and ignore your verbal commands, but if he’s a good listener, a stern “No, Fido!” could really save your furniture. Wi-Fi. You will likely want your camera to connect wirelessly to your router so that you can access it from your phone at any given time. There are types of monitoring cameras that will provide you a handheld device but that’s more for babies you check on while they’re just in another room where the handheld can also access your WiFi. If you want to monitor your dog, it’s likely because you’re not there, and in that case you’ll need something that will connect to the internet for you. Smart home. If your home is enabled with several smart devices, then a camera that works with your home can come in handy. For example, through Amazon Echo (or Alexa as the Virtual Assistant is named), you can operate several devices through your voice. So when you’re in bed and your doorbell rings, you can check your Alexa app (or your video enabled Echo Show) to check who’s at your door. If you want to let your pet sitter in while you’re away, you can disarm the security system, watch them take your pooch out, and set it again after they leave. You’ll never need to give your pet sitters your security information again. Night vision. This is especially important if you have dark areas of your home or you plan leaving your dog overnight. Checking in on a dog that is lying in the dark without a night vision camera is going to be pretty difficult. Add in a camera with night vision and you can check in on him any time of day; even if it’s overcast or storming. Mobility. You may be able to get away with mounting a camera in a strategic place that won’t require it be moved ever to view the entire room. But more likely is that you’ll need your camera to toggle from one side of the room to the other and maybe even up and down. Pan is the term referring to left and right movement and for a ball style camera, it can go up to 360 degrees. Tilt is the motion from up to down and generally this goes roughly 100 degrees or less, if at all. Motion detector. You can opt for a camera that only pops on when it senses movement and save some on your energy bill and some lag on your internet. But the real reason you will want this is the smart notifications that you will likely get with motion detection. You can set your app up to receive an alert when there is motion on the camera. Often times, when you receive your notification, you’ll also get a short video clip that shows you what was happening to set off the detector. That will most likely put your mind at ease but for the worst case scenario, it’s still nice to be prepared. You’ll need to play with the settings to make sure it recognizes your dog (and not as a person) and see if you can get your notifications just right for you, but if you can, this is a very convenient feature. Recording. You can set some cameras up to record up to a certain number of hours and store them on a memory card for your viewing later on. Others come with access to their own cloud or you can pay a subscription fee to store your recordings onto a cloud service. But recording in one way or another is an excellent feature if you check in on him and find something out of place. If you notice your couch has a tear in it, rewind the video to see what happened. Maybe it really was the cat. What is a dog monitor camera and how does it work? A dog monitor camera is any camera that you use to monitor your dog. (We know. Obvious.) But in order to best monitor your dog, you’ll want a few specific features that others may not have. You’ll definitely get good use of a 2-way audio camera; your pup will hear your voice and either be comforted or scolded away from bad behavior. You can also get a camera that will dispense treats for your pup and that’s generally a big difference between a dog monitor and others. Unlike other monitors, you probably won’t want a handheld receiver and rather, should opt for a camera that you can check while you’re away from home. After all, when you’re home and wondering what your pup is up to, all you have to do is call him and he’ll come. It’s when you’re away that he gets into trouble. Do I need to install an app to use a dog monitor camera? Sometimes you will and sometimes you won’t. We’d venture a guess that most of the time you will need to install an app on your phone or tablet. Monitors that come with their own viewer are generally those that need to be within a short range to work; like a traditional baby monitor. This is a good idea for any monitors you set up to watch your dog in the back yard while you’re inside or unable to see all the various nooks and crannies he gets into. A lot of monitors have websites you can stream your feed from on your work computer so you won’t need to use your phone or tablet but pretty much all have an app that will also work, no matter where you are. What’s the difference between a dog monitor camera and a two-way camera? Sometimes there is no difference between a two-way camera and a dog monitor. Most dog monitor cameras have specialized features that will accommodate a dog and the unique needs he has (or that you have for watching him) but other times, you can use a two-way audio camera for your dog snooping and still have the desired effect. A dog monitor camera can have fun features like an auto treat dispenser or a motion detector, but really any camera that will allow you to tell your dog “No! Get down!” is probably going to be an effective one. How do cameras with treat dispensers work? Of course all treat dispensers perform slightly different but in general it’s a relatively simple process. You download an app on your phone that will connect with the camera and treat dispenser, then you can control how many treat your pup gets by touching a button and the dispenser at home will drop the treat into a receiving plate for your dog to grab. Or it will just drop it on the floor, or possibly shoot it up into the air for your dog to practice catching. There are types are that are automated and your dog can treat himself, but beware, unless it comes with a limit of some kind, it takes a very self-disciplined dog to keep from eating the whole supply of treats within minutes. This dog monitor allows you to watch your pup as you auto feed him and there’s no other way to put it: it’s just so fun to watch. This pet monitor will dispense treats, allow you to talk to your pet and post your snapshots instantly to social media. You can give treats and watch your puppy now or later with this camera’s cloud recording. Watch your pup live and snap a few pictures while you give him his treats and chat with him. This camera comes with access to Amcrest Cloud, which will allow you to store recorded video from your live feed and go back to look at your dog’s day later. You and your family can each download the app and check in on your dog through several devices; with login information, multiple users can watch your video live. If you check in to find your dog looking especially lonely, connect the camera to a nearby Bluetooth device and play him some upbeat music to lift his spirits. You won’t even remember your camera is there until you’re loading the app and checking in because this light bulb camera is so cleverly disguised. With this camera, you can record video or pictures on your phone, through the app or upload to the cloud and share instantly. Not only can this monitor detect motion, it can distinguish between a person or dog entering a room and activity of someone already in the room. 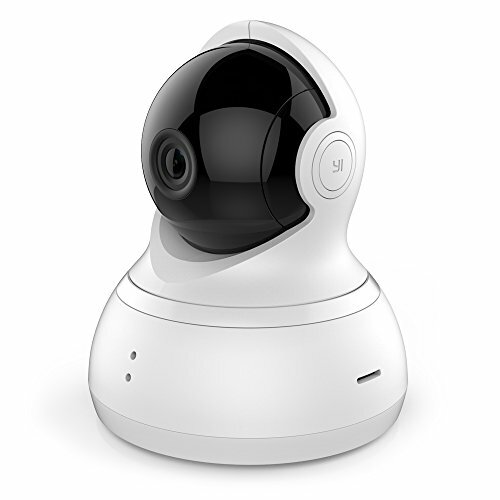 Mount this dome-style camera and see the entire room with 360 degrees and record video on your own TF card or with cloud storage. You can sync this up with your Alexa and any other Nest devices you have and pick up a pack to help make your house an all-over smart home. Your camera can be set-up with motion detection and will send an alert to your phone with a video clip to show you what the motion was so you won’t need to worry. This camera uses a micro SD card for recording and storing video and gives smart alarms for motion detection. This dog monitoring camera can record your live feed with an SD slot that will support up to a 128GB SD card. Pick up a 2-pack of pet cameras that will allow you to closely monitor your pup by sending video clips with the smart alerts of motion or more. With over 2,000 customer reviews, giving this camera a rating of 4.0 stars (not an easy feat for electronics! ), it’s easy to see why it’s Amazon’s choice for Cloud Cam. This smart camera will sync and work with Amazon Alexa, Google Assistant, and the IFTTT cloud service; making your home all the smarter. You can set up a system to cover your whole house so you can move from one camera to another to watch your dog wherever he goes. True, the lullaby and bunny ears are meant to comfort your baby, but we see no reason you can’t use the same on your fur baby, too. Jenny is a frequent contributing author for Pup Life Today. She’s originally from Central Ohio but has lived all over the world with her family, including Texas, Florida and Germany, among other places. She’s taken her two fur babies (and human ones, too) with her along the way and currently calls Eastern PA home. Jenny has been writing on all things pets (mostly focused on dogs) since 2015 and hopes to continue honing her expertise for many years to come.